Ungarie is a southern NSW town with a population of a few hundred. The football and netball club plays in the Northern Riverina League. 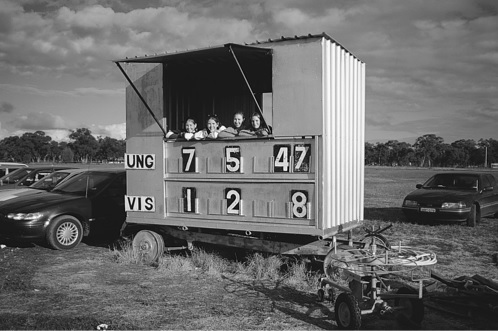 Its scoreboard, circa 2000, records the Magpies’ early lead in a game against Girral-West Wyalong. The home team, captain-coached by Chris Daniher, team won by 179 points. 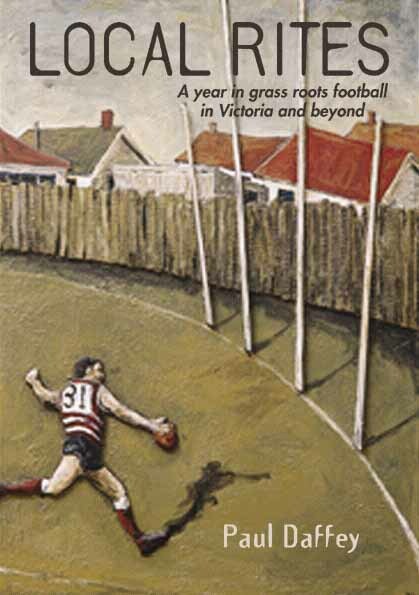 The photo is from Paul Daffey’s 2001 book Local Rites, A year in grass roots football in Victoria and beyond. Chapter 15 of the book, Land of the Danihers, details a weekend spent in Ungarie. The Ungarie Football Club was formed in 1914 according to Paul and in 1916 according to the club’s Facebook page. Jim Daniher, grandfather of the four Daniher boys who went on to play for Essendon from the late 1970s to the 1990s, was foundation president. His son, also named Jim, married Edna and they had eleven children, including Terry, Neale, Anthony and Chris. Chris Daniher and team-mates. Photo by Paul Daffey. 2000. ‘After playing 124 games for Essendon over 11 seasons, Chris headed back to our family farm in late 1997. After a couple of years in the Riverina league with Temora, he completed a full-circle by pulling on the boots for Ungarie again. In his first couple of years back there, the local footy club was firing. 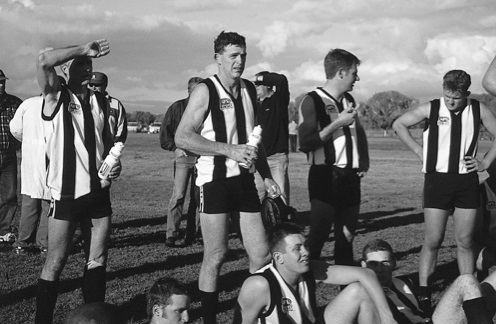 Under Chris’ leadership, the mighty Magpies won premierships in 2000 and 2001. He won the league best and fairest in both those years. ‘People like Chris love crossing the white line and having a contest. They love to come up against the young bucks from the next town and teach them a trick or two.